I can't decide if today's column is about a stitch (it is) or about threads (it is). Because, frankly, the diagram is kinda boring. The stitched sample is far from boring. The stitched sample uses DMC Perle #5 (light gray lines), Neon Rays (black lines), and Fyre Werks (turquoise lines). 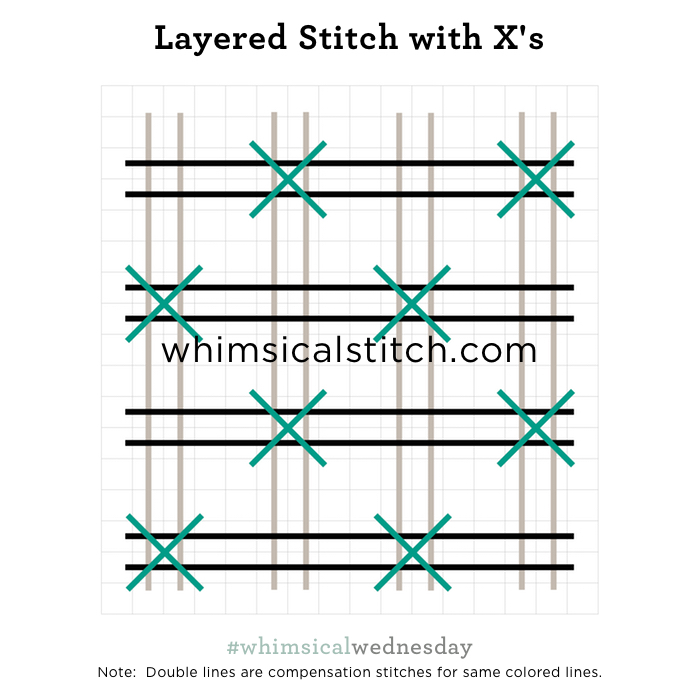 The layering for this stitch is very important. Start with the light gray (vertical) lines, followed by the black (horizontal) lines, and end with the X's on top (aqua lines). The stitched sample is from the retired Linda Carter Holman piece I've featured in a few posts recently (here and here). More often than not, I use the same threads for the straight stitches in a layered stitch. Today's sample is an exception to my typical pattern...and I like it. Two distinct threads for the straight stitches add contrast, especially the Neon Rays. The two rows of Neon Rays merge together to look like a wide ribbon, a fun contrast to the distinct shape of the DMC Perle. Clearly, a laying tool played a role here. This stitch would be so much fun with different colors. Imagine it as a coat for a Santa with Very Velvet (vertical lines), Vineyard Silk (horizontal lines), and an oversized Kreinik in a contrasting color, such as gold, for the X. Consider using two colors for the stripes, say blue for the vertical and green for the horizontal, tied down with a third color for a bedspread or decorative pillow. Combine some really unique textures, such as Rainbow Linen and Impressions for the straight lines, and tie it down with Wisper or Fuzzy Stuff for a very au natural roof.